We are located in a small Brittany valley, not far from Normandy and Mayenne, in an old farmhouse, surrounded by fields and meadows. Wild animals (roe deers, pheasants, rabbits, hares, and even wild boars) regularly visit us. Pastures of the farm feed our horses abundantly and are superb frolic and training parks for our dogs. All my dogs are of course registrated in the LOF and confirmed, and came out in dog show. They are all at least presented to the natural aptitude tests of their breed (herding for australians, hunting for cockers), possibly to other tests (character tests, sociability test) and work regularly. I systematically pass veterinary tests recommended by their respective breed club (of which I am a member). When genetic tests are available, they are of course privileged. No dog reproduces before the average age of 2 years for shepherds, 18 months for cockers. The girls only reproduce once every 18 months on average. The annual number of protrusions of each male is limited. Retirement is envisaged at 7 years old and its determined by the shape of the dog. All dogs discarded from the kennel are sterilized and kept at home or placed in family. Puppies are born at home. As soon as they are large enough, puppies are regularly out in awakening park, installed in the garden : a large park filled with toys and various objects where they can frolic. They are also put in contact with other adults than their mother, for their skills. As they grow, they begin to learn the car, the necklace and the leash, the reminder. Puppies leave kennel at 2 months old. They are identified by microship, first-vaccinated, wormed. They are of course all registrated in the LOF. They are accompanied by their breeding booklet. The latter includes, in addition to the certificate of sale, the health book, the identification card and the certificate of registration to the LOF, a presentation of the breed, advices for first days of the puppy in his new family, photocopies of the parents' files : pedigree, DNA identification, aptitude tests, veterinary tests. Are also handed over to the owner, pet food, a bowl, a leash and a collar. Puppies who leave in France have an accident insurance during the two first months. 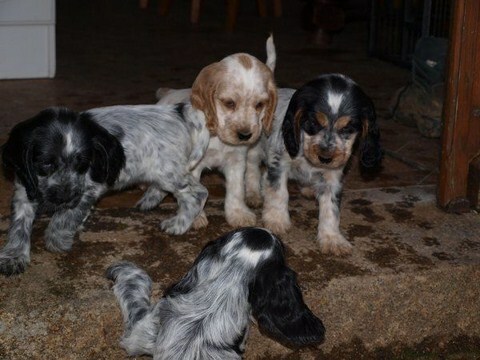 The puppy's follow-up is ensured for all his life : welcome news and photos ! In case of questions or problems, do not hesitate to contact me : in particular, if for a reason or another, you can not keep him, we will be able to find a solution together. Before being your puppy, it was mine, and will always remain a little throughout his life !! Females must have their pedigrees of course, but also be tested : at least PRA and FN for cockers. Additional tests (hips for example) are strongly encouraged. I reserve the right to refuse a serving, in particular if I believe that pedigree of the female is not compatible withthat of the choosen mamle (e.g. inbreeding) or if age and condition of the female are not compatible with the good proceedings of a gestation. Any serving will be the subject of a contract. The price is set according to each male (depending on breed, age, results). It's due at the time of the serving. If the female remains empty or if the litter has a single puppy, a second serving will be offered. 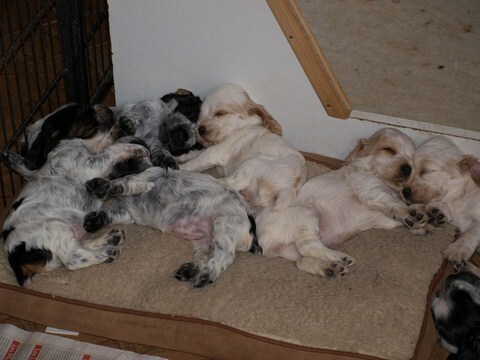 Just as with my puppies, news and photos of the litter are welcome : even if they are not born in my home, these puppies are children of "my boys" and it is always nice to see them grow.